The entire length of the Boka Kotorska bay (literally “inlet” and also known as the Bay of Kotor) is 15 nautical miles or 28 km. In the 4th century Bc the Greeks founded the town of Risan here and Budva further down the coast. The Romans, after defeating the Illyrian tribes, settled in 2nd century Ad, renaming the coast Dalmatia. By the 5th century, after the roman empire had been divided, the Boka Kotorska remained under western influence while the rest of the land became part of Byzantium. But by the end of the 6th century the southern Slavs had taken all the territory inland and the Dalmatian coast into a bargain. Although from the early 15th century until 1797 the Republic of Venice was a significant presence in this inner part of the Boka Kotorska and left such an indelible mark, the region has always essentially been the domain of its indigenous seafarers acclaimed over the centuries for their mastery of all maritime matters. Our dear Boka, Adriatic’s bride. Droped with the sky like with silk blue, Prettier than any Nereid are you, Upon you beauty you should yourself pride. Painters, poets, scientists, tourists, they all experienced the Boka Kotorska in a different way. Everybody finds motive or inspiration for oneself, experiences it as something special, unusual, prodigious. 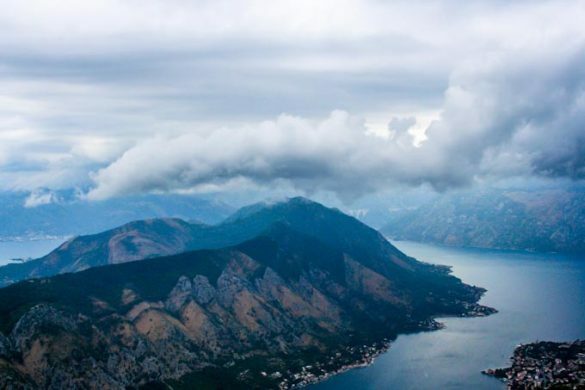 And the Boka Kotorska is, which was confirmed by signing the Kotor–Risan bay on the list of World’s natural and cultural heritage of Unesco, and accepting the Bay in the Club of the most beautiful world bays. 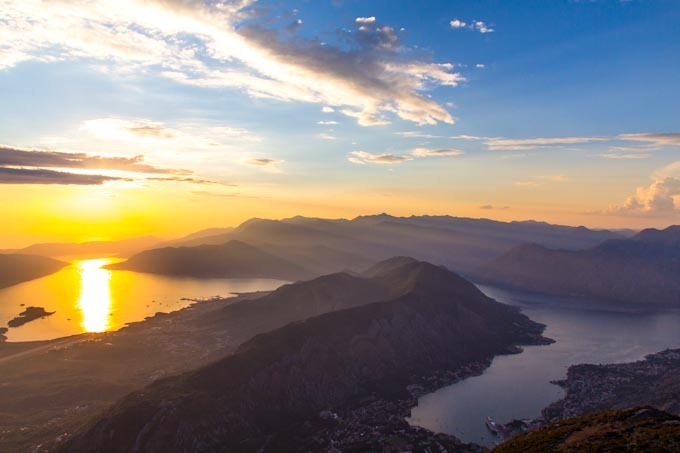 The Boka Kotorska is full of differences: high mountains and extensive sea, continent and Mediterranean, two civilizations, east and the west. All those differences in the Boka Kotorska unify. It’s easier to see that harmony of differences in the historical and cultural heritage than in nature. We can notice the presence of many civilizations, cultures, and styles – prehistoric fossils, iliric epoch, antique, prelatin, latin, gothic, renaissance, baroc. The Boka Kotorska has a special kind of climate. There is a lot of rain in late autumn and winter, since the 1000-1700 meters high mountains stand in the way of cyclones coming from the direction of the sea, bringing rain. There is also a little bit more rain during summer than in other coastal areas of Montenegro. Consequently, a special flora developed along the Boka Kotorska. In spring, when the mountains around the bay are still covered with snow, at the foot of the mountains fruit trees begin to blossom and flowers to bloom. The water surface of the bay is rimmed with luxuriant agave’s, palm trees, oleanders and pomegranate-trees. The nearby hamlet of Risan was a thriving Illyrian city called Rhizon as early as 229 BC and gave its name to the bay, then known as Rhizonicus Sinus. Queen Teuta of Illyria retired from Shkodra to Rhizon. Rhizon eventually submitted to Rome in 168 BC, at the same time that Acrivium, or Acruvium, the modern Kotor, was first mentioned as a neighboring city. The Sklavenoi, South Slavs, settled in the Balkans in the 6th century. The Serbs, mentioned in the Royal Frankish Annals of the mid-9th century, controlled a great part of Dalmatia (“Sorabos, quae natio magnam Dalmatiae partem obtinere dicitur”). The Slavic, Montenegrin tribes, consolidated under the Vlastimirović dynasty (610–960). The two principalities of Doclea and Travunia were roughly bordered at Boka. As elsewhere in the Balkans, Slavs mixed with the Roman population of these Byzantine coastal cities. The Theme of Dalmatia was established in the 870s. According to De Administrando Imperio (ca. 960), Risan was part of Travunia, a Serbian principality ruled by the Belojević family. After the Great Schism of 1054, the coastal region was officially under the Papacy (the West). In 1171, Stefan Nemanja sided with the Venetian Republic in a dispute with the Byzantine Empire, with the aim of gaining full independence from Byzantine rule. The Venetians incited the Slavs of the eastern Adriatic littoral to rebel against Byzantine rule and Nemanja joined them, launching an offensive towards the coastal city of Kotor. The Boka Kotorska was henceforth under the rule of the Nemanjić dynasty. In 1195 Nemanja and his son Vukan constructed the Church of Saint Luka in Kotor. King Uroš built the Church of Saint Paul in 1266–69. In 1219 Saint Sava founded the seat of the Eparchy of Zeta on Prevlaka, one of the eparchies of the Serbian Orthodox Church, which greatly helped spread Orthodoxy. The heart of Orthodoxy was in the Church of St. Michael (destroyed by Venetians in the 15th century). During the Serbian Empire, several Kotorans rose to the highest ranks. The town of Kotor was under Nemanjić rule until ca. 1370. It became a part of the Kingdom of Bosnia. Its merchant fleet and importance gradually increased, and after the fall of Serbia to the Ottoman Empire in the late 14th century, Kotor was seized by the Venetian Republic. Part of the Boka Kotorska area was conquered by the Ottomans at the end of the 15th century, and the Venetian Republic held the southern part with the city of Kotor. The Ottoman part was retaken at the end of the 17th century and the whole area became part of the Venetian Republic, with the name of Albania Veneta. Until the 20th century the difference between the two parts was visible because the former Ottoman part had an Orthodox majority, and the part that was under Venetian rule had a Catholic majority. With the Ottoman expansion in the Balkans and fall of Serbian statehood in the 15th century, Venetians started to expand into the Boka Kotorska. The relative majority of Boka’s citizens were Montenegrin Orthodox, under the jurisdiction of the Metropolitanate of Zeta. Venetian rule brought Italian language and culture in Boka, which was partially accepted by its population. Throughout Venetian rule, various attempts of assimilation of the Slavs were attempted, but failed. In 1451 and 1455 the Venetian Doge issued orders to the bishop of Kotor to work on conversion of the Orthodox under his jurisdiction and confiscation of their property. The Venetian governor of Kotor banished all Orthodox from Bogdashich and Kavchani and committed serious atrocities on Prevlaka in 1672. 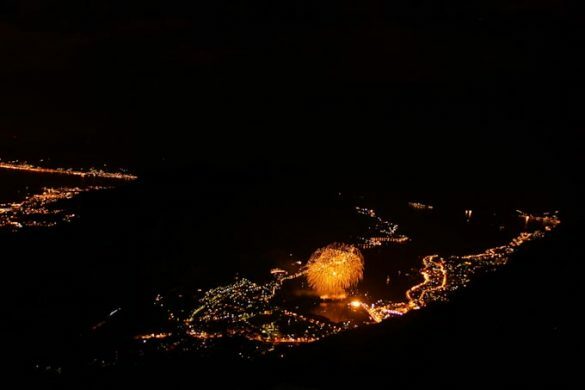 The town of Perast had extremely difficult moments in 1654 when the attacks of the Ottomans were especially dangerous, they were doing this because the Bokeljs sank an Ottoman ship. The brave and successful defense of Perast and Boka by Bokeljs received attention all over Europe. This was the reason of the arrival of Petar Zrinski, a famous statesman in Europe who also had numerous dramatic battles with the Turks. During his three day sojourn in Perast he presented his legendary sword to the town, as the sign of his recognition to their efforts to defend their homeland, and to stop the approach of the Ottoman Empire to Middle Europe. In 1669, according to Andrija Zmajević, hajduks of the Bay wished to build a church, but were denied thanks to Zmajević’s intervention on the providur of Kotor and captain of Perast. 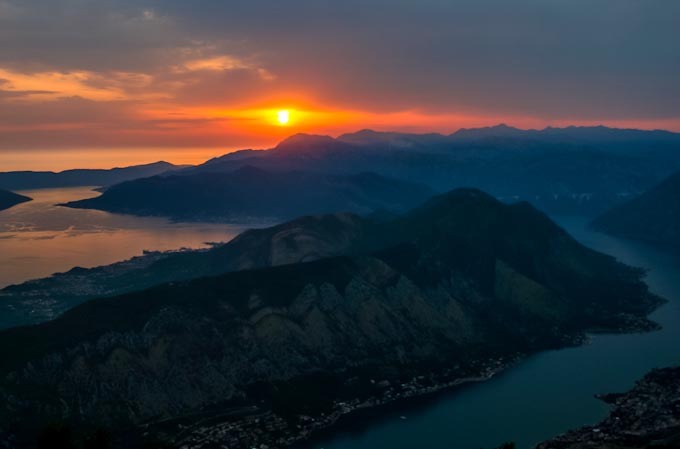 At the beginning of the 19th century the region around the Boka Kotorska was included in the Napoleonic Kingdom of Italy and later in the Illyrian provinces, which were a part of the French Empire. The region was later conquered by Montenegro with Russian help by the Episcop of Cetinje Petar I Petrović Njegoš and, in 1813, a union of the bay area with Montenegro was declared. In 1815, the bay was annexed by the Austrian Empire (Austro-Hungary since 1867) and was included in the province of Dalmatia (part of Cisleithania since 1867). In 1848, when the numerous revolutions sparked in the Austrian Empire, an Assembly of the Gulf of Kotor was held sponsored by Petar II Petrović-Njegoš of Montenegro, to decide on the proposition of Boka’s unification with Croatian Ban Josip Jelačić in an attempt to unite Dalmatia, Croatia, and Slavonia under the Habsburg crown. The Assembly brought the decision that “The Gulf of Kotor, according to its location, history, language and tribal majority belongs to Serbs”. The Serb National Guard of Kotor however refused the proposition and Stefan Mitrov Ljubiša wrote in the name of the Assembly to the Croatian Parliament in Zagreb and to Njegoš how they refused the option to join Croatia, stating that they would rather first await the national unification of Serbs and then that of all South Slavs. He also stated that “The people of Boka Kotorska are pure Serbs”. In the early 20th century Boka’s character was considered Yugoslav. In 1838 was in Kotor constructed the “Thumb of Serbian Gathering”, a three-store house. In 1839 the Serb Singing Society “Unity” was founded in Kotor. It celebrated its 100 years of existence in 1939. In Kotor was also founded the same year the Serb Reading-room; although it was renamed to “Slavic” in 1849 so that it could gather Kotor’s Montenegrins, Croats, Slovenes and Czechs as well. The City received in 1848 the “Serbian National School under the tutelage of the Church, the “Serb Music School” in 1854 and the famous “Serb National Guard of Kotor” in 1862, which held all major influences in the Bay of Kotor and celebrated its 50 years of existence with the Kingdom of Montenegro in 1912. In 1868 Kotor received the “Serb national benefaction society Saint George”, the Orthodox Serb Study-room in 1869 and the Serb Orthodox Episcopate in 1870. In 1874 the annual yearbook of the Serb-Orthodox Boka-Dubrovnik Eparchy’s printing started in the city. The “Croatian Home” was founded in the City in 1893. Kotor gained the “Serb Female Elementary School” in 1893, the “Serb tamburitza Zbor” in 1895, the “Serb Music” in 1897, the “Serb Workers’ Zadruga” in 1899, the “Serb Credit Zadruga” in 1901 and the “Serb Sokol Society” in 1910. In 1903 the “Unity” singing society formed “The Alliance of Serbian Singing Societies”. In 1916, during World War II, the Croatian brotherhood “Bokelj marine” conquered Lovcen in the name of the Central Powers during the capitulation of Montenegro. An attempt was made to take the bay by the Kingdom of Montenegro during World War I. It was bombarded from Lovćen, but by 1916 Austro-Hungary had defeated Montenegro. On 7 November 1918 the Montenegrin army entered the bay and was greeted by the people as liberators. It became a part of the State of Slovenes, Croats, and Serbs. The State of Slovenes, Croats, and Serbs joined the Kingdom of Montenegro. Within a month, the Kingdom of Serbs, Croats, and Slovenes was formed and was renamed as Yugoslavia in 1929. The bay was a municipality of Dalmatia until it was, as all historic entities, re-organized into smaller districts in 1922. It was incorporated into the Zeta Area, from 1939 Zeta Banate. After the assassination of King Alexander in Marseilles, some nationalist Croat politicians talked of a Croatian regional autonomy, the Croatian Banate, that was to include 8 settlements in Boka that an ethnic Croat majority; however, as these were too far away from the Croatian central core the Croat politicians demanded that the whole of Boka was to be included into their Banate. At that time, a little below a quarter of the population identified as Croats, and there was a general viewpoint that the Boka Catholics were ethnic Croats. According to the 1910 census, the Boka Kotorska area had 40,582 inhabitants, of whom 24,794 were Orthodox Christians and 14,523 Catholics, but in the same time in the coastal area of the Boka Kotorska there were 22,823 inhabitants of which 13,002 were Catholics and 9,331 were Orthodox. From 1918, the Boka Kotorska was part of the Kingdom of Serbs, Croats and Slovenes (renamed Kingdom of Yugoslavia in 1929). Between 1918 and 1922 the region was a separate county administered from Kotor (still in Dalmatia. Between 1922 and 1929 it was part of Zeta Oblast, and between 1929 and 1941 part of Zeta Banovina. According to the 1921 census, Boka had 36,539 inhabitants, of whom 23,777 were Orthodox Christians and 12,342 Catholics. In a decade’s time (1930s-1940s) the number and percentage of Orthodox Serbs in the Croat municipalities greatly increased. The region of the Boka Kotorska was occupied by the Italian Army in April 1941, and was included in the Italian Governatorato di Dalmazia until September 1943. Since 1945, it has been part of the Republic of Montenegro. Today, most of the region’s inhabitants are Orthodox Christians, declaring themselves on census forms as either Serbs or as Montenegrin’s, while a minority is Croatian. 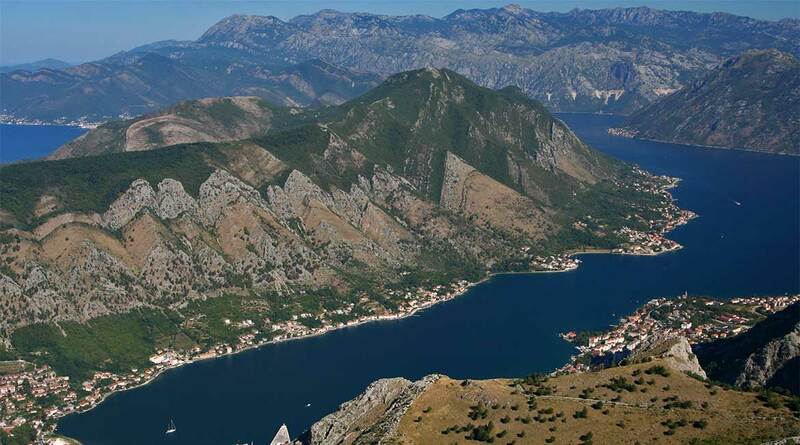 The Boka Kotorska region is under the protection of UNESCO due to its very rich cultural heritage. 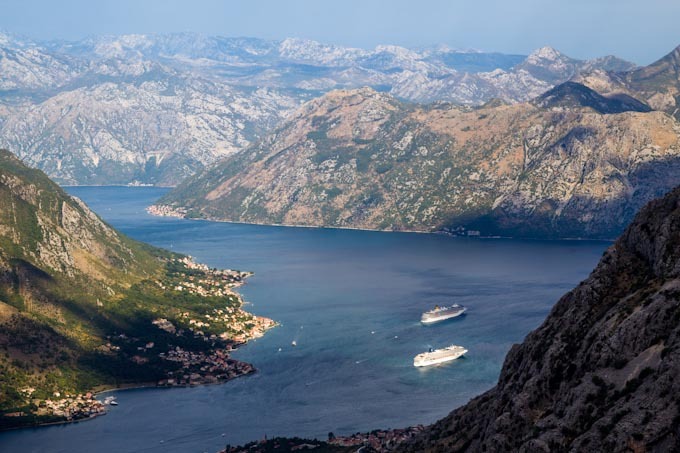 The Boka Kotorska region has a long naval tradition and has harbored a strong naval fleet since the Middle Ages. The fleet reached its peak of 300 ships in the 18th century, when Boka was a rival to Dubrovnik and Venice. 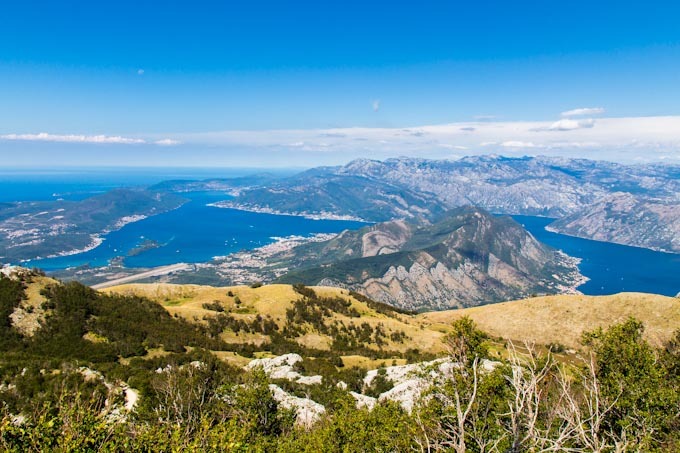 The population of the Boka Kotorska are also known as the Bokelj or Bokez. Today the Boka Kotorska has about 100 Catholic churches and chapels and about 200 Orthodox churches and chapels, as well as some Orthodox monasteries. The Cathedral of St. Trifun in Kotor is Boka’s oldest cathedral, built in 1166. The churches of St. George and Lady of Škrpjela (near Perast) were built on two of the bay’s islets in the first half of the 17th century. The bay is naturally divided into four smaller parts: the Herceg-Novi-bay, Risan-bay, Kotor-bay and Tivat-bay. As pearls, the small towns, as treasuries of history, art and beauty, are strung on their coastline, with Kotor as an old coastal and cultural center. For centuries, it has been a crossroad of commercial itineraries under strong influence of Venice. It is protected by mountains with a strong defense structure built during the time of the Byzantine Empire. Dobrota is a small town in which numerous palaces of former sailors and shipowners are still preserved. Perast is the hometown of many world-known sailors and a town whose destiny has always been related to the sea. By its lifestyle, it resembled Venice with which it had a very lively trade and cultural links. There are a lot of remains of the old aristocratic palaces that now bear witness to the ancient splendor and richness. In one of them, the Bujevic’s palace, the Town Museum is located. There is a very interesting historical story saying, that the Russian soldiers used to come to Perast to learn sailing skills and that it was known as a cradle of the Russian fleet. There are two islets around Perast: Gospa od Skrpjela (Lady of our Rocks) and St. George, two unique tourist attractions. Risan is famous for the remnants of the classical culture. The remains of a Roman patrician’s villa with mosaic floors as beautiful as those made in Roman period can be found here. Herceg-Novi is a town situated at the end of the bay. Its appearance is an illustration of its turbulent history. The town is a fine combination of romantic, Byzantine and oriental styles inter weaved in its own Mediterranean appearance. 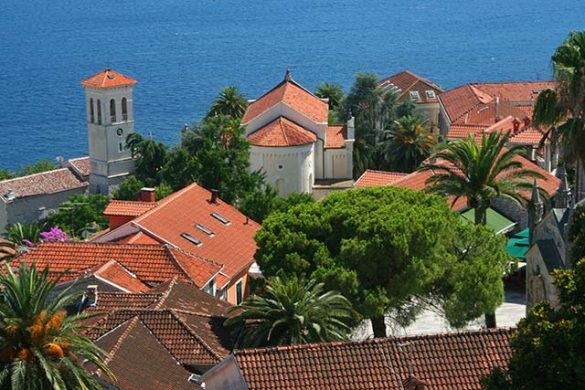 Today, Herceg-Novi is the town of flowers with all its windows faced toward the sun and the sea. It is one of the warmest towns at the Adriatic coast. 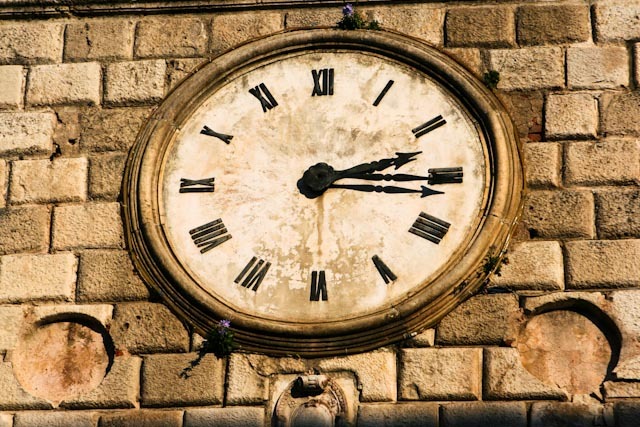 One should visit the City Museum and the Archives, the Modern Arts Gallery, the old town with tower clock and especially the Boka Kotorska itself. The gulfs of Herceg Novi and Tivat are connected via the Kumbor strait, while the extremely narrow Verige strait connects the gulf of Tivat with the gulfs of Risan and Kotor. The total area equals 88 square kilometers. The gulf of Herceq Novi empties into the Adriatic Sea. Overseeing the whole Boka Kotorska bay. Due to its unusual look, the bay is often called Europe’s southernmost fjord, but in fact it’s a submerged river canyon. Herceg Novi — founded in 1382 and located in the entrance of the Bay of Kotor. Risan — the oldest settlement in the bay, historical capital of the Illyrian kingdom. Tivat — the youngest town in the Boka area established on the plateau at the bottom of Vrmac. The Boka Kotorska has since long been the most important tourist region in Montenegro. Although Budva has always been the most visited city, the area around it is somewhat subordinate to all that the whole bay has to offer. It’s beautiful historic towns like Kotor, Herceg Novi, Perast, Tivat and Risan, the beautiful natural surroundings, the great history of the area, filled with many small fairytale-like fishing villages. Hence, throughout the bay there is a lot of accommodation available. Especially in recent years, the offer of apartments has grown exponentially. Also all other types of accommodation such as hotels and the like, but not to the extent of apartments that are seen as good investments by their owners. In addition to all new buildings, there are also historical buildings that are converted into accommodation that keeps the charm of the area and the visitors can experience the bay in a more romantic way. This is mainly the case in the historic old town centers of Kotor, Herceg Novi and Perast. Due to the discovery of the area in recent years, major investors have launched prestigious projects. Where the most famous and the main one is the luxury marina Porto Montenegro, which has also brought it’s own form of high-end accommodation. Due to the wide variety of accommodation available, a list of the best accommodations by different classes and accommodation is given below. Best Hotel in the bay € 0 – € 50 per night. Hotel Bokeljski Dvor – Classic rooms offer a minibar, air conditioning, personal safe, storage box and high ceiling. Some rooms overlook the sea. The private bathrooms have a shower, hairdryer and are provided with beach towels. The hotel offers a terrace and a restaurant specializing in fish dishes. 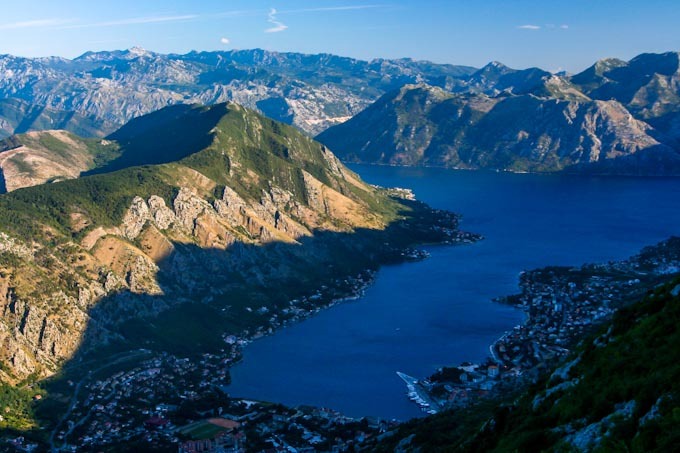 It is a 10-minute drive from Kotor’s old town. Facilities : Restaurant (à la carte), Free Parking, Free Wi-Fi Internet Access Included, Terrace, Garden, Beach, Bar, Airport Shuttle, Laundry (surcharge), Ironing Service (surcharge), Luggage Storage. Best Hotel in the bay € 50 – € 100 per night. Conte Hotel & Restaurant – Hotel & Restaurant Conte is located in the former House of Culture, by the water, in the central square of Perast, and is a protected monumental building. The restaurant specializes in local and Mediterranean cuisine and uses local ingredients to prepare meals. The hotel features elegantly decorated suites and rooms with beautiful views over the Perast islands. The local bus station is next to the property and the supermarket is just 50 meters from the Conte Hotel. Facilities : Restaurant (à la carte), Free Parking, Free Wi-Fi Internet Access Included, Terrace, Garden, Mini Bar, Bar, Airport Shuttle, Laundry, Ironing Service (surcharge), Luggage Storage, Tour Desk, Express Check-In / Check-Out. Best Hotel in the bay € 100 – € 150 per night. Location – Kotor (old town). Best Hotel in the bay € 150 – € 200 per night. Monte Bay Retreat – A new boutique hotel, tailored accommodation nestled in one of the nicer spots in the Boka Kotorska. Each beautiful room is uniquely decorated, with individual features ranging from bathtubs at the foot of the bed to cozy fireplaces. Monte Bay Retreat features a beautifully designed outdoor swimming pool that can be used all year long. For a meal, go to the restaurant’s restaurant and enjoy a drink at the bar. Facilities : Restaurant (buffet), Free Parking, Free Wi-Fi Internet Access Included, Terrace, Sun Terrace, Garden, Concierge Service, Mini Bar, Bar, Airport Shuttle, Laundry Service (surcharge), Ironing Service (surcharge), Luggage Storage, Tour Desk, 24-Hour Front Desk, , Barbecue facilities (surcharge), Sauna, Massage (surcharge), Hot tub / Jacuzzi, Outdoor swimming pool (all year round). Best Hotel in the bay € 200 + per night. Regent Porto Montenegro – Regent Porto Montenegro has 86 rooms, 35 hotel rooms and 51 apartments, including studios, 1-3-bedroom apartments and penthouse suites designed by Tino Zervudachi. This luxury hotel was built in the Venetian style of the Renaissance. These sophisticated, contemporary living spaces are covered by their multifunctional design. Bedrooms and living areas enjoy a relaxing combination of beige, blues and natural forests. The spacious bathrooms include a free-standing bath, rain showers and underfloor heating. It is part of the luxury Porto Montenegro Village part of the Porto Montenegro marina. 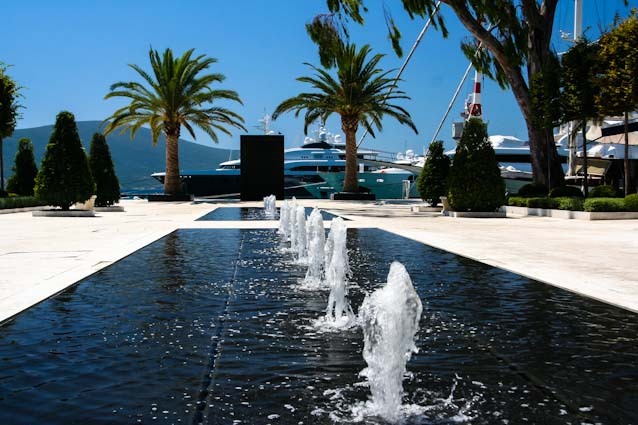 Location – Tivat (Porto Montenegro). Facilities : Restaurant (à la carte), Free Parking, Free Wi-Fi Internet Access Included, Terrace, Sun Terrace, Garden, Concierge Service, Mini Bar, Bar, Airport Shuttle, Laundry, Dry Cleaning, Ironing Service (surcharge), Luggage Storage, Tour Desk, 24-Hour Front Desk, Ticket Service, Sauna, Massage, Hot Tub, Jacuzzi, Snack Bar, Outdoor Swimming Pool (seasonal), Indoor Swimming Pool, Hammam, Meeting / Banquet Facilities, Breakfast in the Room. Best Bed & Breakfast/Guest house in the bay € 0 – € 50 per night. Guest House Dragutinovic – The ambiente Guest House Dragutinovic offers free Wi-Fi throughout the property and panoramic views of the sea, islets and Perast. All rooms include a kitchen, flat-screen satellite TV and a private bathroom. Guests can enjoy views of the surrounding Orjen Mountains. All rooms have a terrace at the guest house. A seating area is available to all guests. All rooms have an oven. Guest House Dragutinovic also offers barbecue facilities. Biking is one of the activities that guests can enjoy near this accommodation. Facilities : Free Wi-Fi, Terrace, Sun Terrace, Garden, Airport Shuttle, Patio, Massage (surcharge), Barbeque Facilities, Terrace Furniture, Extra Long Beds (> 2 meters). Best Bed & Breakfast/Guest house in the bay € 50 – € 100 per night. Villa Banicevic – Palazzo Banicevic Luxury Rooms offers free Wi-Fi in all areas and is located in Prcanj. This 5-star guest house offers air-conditioned rooms with a private bathroom. The rooms have a terrace with sea views. Bikes can be rented at this guest house and offers excellent service. It is located next to the historic monument of the Tre Sorelle villa. Facilities : Free Parking, Free Wi-Fi Internet Access Included, Terrace, Sun Terrace, Garden, Airport Shuttle, Outdoor Swimming Pool (seasonal), BBQ Facilities, Extra Long Beds (> 2 meters), Fitness Center, Sauna, Massage, Spa & Wellness Center, Hot Tub, Bike rental. Best Bed & Breakfast/Guest house in the bay € 100 – € 150 per night. Guesthouse Palace Lukovic – Guesthouse Palace Lukovic is set in a 17th-century monumental building with a terrace and views of the sea. It features special antique furniture. Some accommodations have a seating area where you can relax after a busy day. Each room has a private bathroom. There is a shared kitchen and shops at the accommodation. Guests can use the sun loungers at the front of the accommodation. Facilities : Free Parking, Free Wi-Fi Internet Access Included, Terrace, Private Beach Area, Airport Shuttle, Shared Lounge / TV Room, Tour Desk, Massage, Bicycle Rental, Laundry, Breakfast in the Room. Best Apartment in the bay € 0 – € 50 per night. D & Sons Apartments – D & Sons Apartments is located under the fortress of San Giovanni, in the old town of Kotor. Each apartment offers free Wi-Fi and views of the fort. The cozy apartments at D & Sons Apartments feature a fully equipped kitchen and a seating area with cable TV. Some rooms have 2 spacious balconies with panoramic views of the surrounding area. Facilities : Free Wi-Fi Internet Access Included, Airport Shuttle, Sun Terrace, Luggage Storage, Ironing Service, Laundry, Bar, Room Service, Car Hire, Mini Bar, Coffee / Tea Maker, Express Check-In / Check-Out. Best Apartment in the bay € 50 – € 100 per night. Apartmani Centar Igalo – It is located in the heart of Igalo. All air-conditioned accommodation has a private bathroom, a flat-screen TV and a fully equipped kitchen. Each accommodation has large private terraces with sea views. Facilities : Free Parking, Free Wi-Fi Internet Access Included, Terrace, Airport Shuttle, Dry Cleaning (surcharge). Best Apartment in the bay € 100 – € 150 per night. Villa Sandy Apartments – Newly built villa in the village of Djurasevici, near Tivat. It has beautiful views of the coast and the mountains, just a short walk to the beach. It features three modernly furnished two bedroom apartments and an open penthouse. The apartments are equipped with modern kitchens, ensuite bathrooms and guest bathrooms. There is an outdoor swimming pool, with plenty of space and sun loungers around it, comfortable seating area with tables and chairs, and a barbecue. All apartments are separated by a private entrance. Facilities : Free Parking, Free Wi-Fi Internet Access Included, Terrace, Sun Terrace, Garden, Airport Shuttle, Barbecue, Balcony, Outdoor Swimming Pool, Balcony, Tea / Coffee Maker, Terrace Furniture, Laundry. Hostel Old Town – Located in the old walls of Kotor, built in the 13th century, the hostel consists of two parts, Old Town Hostel East Wing and Old Town Hostel West Wing. Each of the dormitories has a private bathroom with shower and toillete. Also in the dorms and rooms there is a small kitchenette and a washing machine available. In both wings there is a larger, fully equipped kitchen to cook more extensively. It also has its own library and personal lockers. Boka Kotorska has an international airport located in Tivat, with regular flights to several European cities, such as Moscow, Belgrade, Paris, London and Kiev. The other Montenegrin international airport is in Podgorica, some 80 km from Tivat and it offers flights to several other European destinations – Vienna, Zürich, Frankfurt, Rome, Copenhagen, Skopje, Zagreb. Buses are very frequent in the area, and are the most popular terms of transport, being usually very cheap and very comfortable. 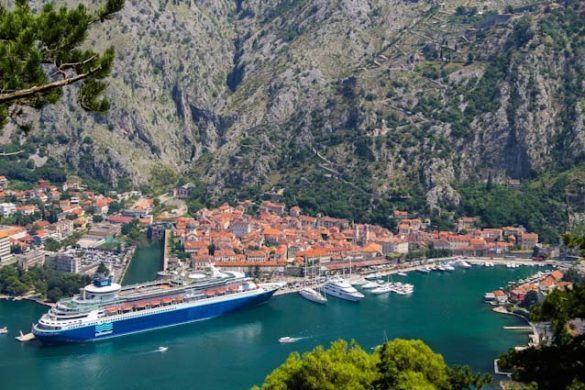 Boka Kotorska has 2 international passenger sea ports: in Kotor and in Zelenika. Port of Kotor hosts cruisers on a daily basis during the summer. Entrances by car can be made by the E65 coming from Croatia going to Herceg Novi passing through the whole bay, from Bosnia and Herzegovina entering in the center at Risan, the E65 in the other direction from Budva going to Tivat or Kotor. From Cetinje following the well known ancient caravan road “ladder of cattaro” with all his hairpins to Kotor. Tourist boats operate on several destinations in the area, they vary from luxury Bateau Mouche-styled boats that offer excursions through the whole bay to small fishing boats that transport tourists from coastal towns to some near, but hardly reachable places (for example: Perast – the island of Gospa od Škrpjela; Herceg Novi – Žanjice beach etc.). There’s a plenty of local bus lines, both inter- and intro-municipal. Taxi service is fairly safe and comfortable, but on the other side also quite expensive. A ferry line operates between the villages of Lepetane and Kamenari in the narrowest part of the bay – the Verige strait. A one-way ticket for an automobile is 4.5€, but pedestrians can cross the strait free of charge. Maximum waiting time for the ferry is 15 minutes, and it runs 24 hours per day. Kotor — visit its Old Town and the surrounding walls. 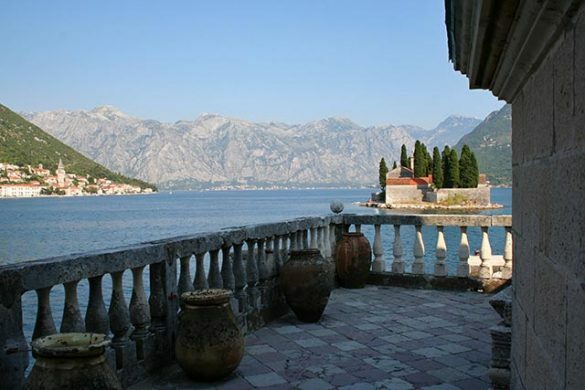 Perast — a well preserved village, built entirely in barroque style, a UNESCO World Natural and Historical Heritage Site. 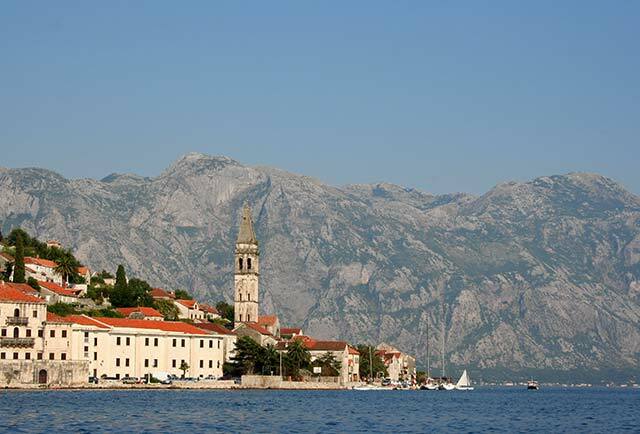 From Perast there is a boat ride to the man-made islet of Our Lady of the Rocks (Gospa od Škrpjela). Upon returning home safely, seamen dropped rocks and old boats filled with rocks in this place and gradually created the islet as the foundation for the church. Boka Kotorska offers a wide variety of restaurants serving both local and international food. For some great Mediterranean cuisine, visit Ćatovića Mlini in Morinj, or Stari Mlini in Ljuta, near Kotor. As far as international cuisine is concerned, the old towns of Kotor and Herceg Novi are packed with Italian restaurants. There are also restaurants serving Dalmatian, Russian, Greek food. Herceg Novi even has a Georgian restaurant. Dishes from Eastern Asia are hard to find in this area. You’ve got a wide choice between open summer bars along the coast or cafés at the old towns’ squares. Prices vary greatly, but usually a bottle of water is around 1€, an espresso or a cup of cold Nescafé cost 1€ – 1.5€, Coca-Cola and similar non-alcoholic juices cost 1.5-2€. 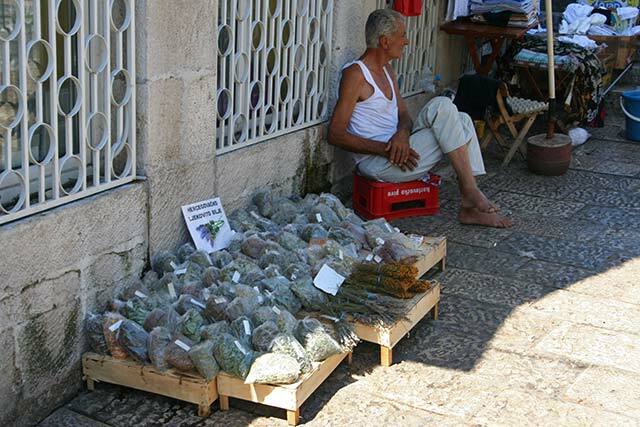 Montenegro is generally a safe country, and this region is no exception to that. Still, be aware of beggars and pickpockets in resort towns.